McKinley High School students including Bryant Lee, nearest right, prepared their robot for the next round which included placing team mascot "Kika Mana," which means tiger power, on the front of the contraption during the First Robotics Competition held at the Georgia Dome yesterday in Atlanta. ATLANTA » For the Honokaa Dragons and their robot, Sally, the quest for victory ended yesterday, but the real triumph was that they were even here at all. A year ago, the team didn't exist, but since then, the Big Island high school robotics team became the standout squad of their region -- earning them their debut at the FIRST (For Inspiration and Recognition of Science and Technology) Robotics Competition. The contest, now in its 17th year, was held this weekend at the Georgia Dome, where more than 10,000 geeky gladiators from 25 countries pitted minds and metal against each other. The matches are part cage match, part demolition derby. The game tests the students' engineering prowess, as they race their robots around a track, knocking down 40-inch balls and passing them over or under an overpass more than 6 feet tall. The event takes on a sportslike atmosphere, with wacky team uniforms, mascots and cheering sections for the competitors. The Honokaa team was one of six from Hawaii at the finals, including an all-girls team and several schools from economically depressed areas of the state. Among the fans who made the cross-country trek to cheer them on: Gov. Linda Lingle. Also competing this weekend was Sacred Hearts Academy and Radford, Waialua, Waiakea and McKinley high schools. By Friday afternoon, McKinley was bearing down on a berth to the final round. The showing was a coup for the state, which had 25 high school teams total competing in FIRST Robotics this year -- up from four the year before. 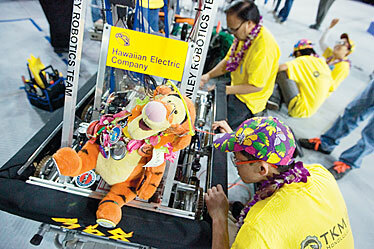 The trip was Lingle's first to a robotics competition outside Hawaii, and she decided to attend the event after the islands held their regional qualifying event last month for the FIRST Robotics Competition. Lingle arrived in time to watch McKinley's Team Kika Mana and their robot, Hawaiian Electric -- named for their longtime sponsor -- compete in their final semifinal match. After giving the team a good luck shaka signal from the crowd, she watched intently as their robot darted around the track, doggedly going after the ball and blocking their opponent from scoring. In the stands, a small but spirited cheering section matched the team, wearing purple leis, team shirts and hats covered in hibiscus. Wilson Liang, part of the mechanical team, was proud of the robot and of Hawaii. "It's great that there are more of us to represent our state," he said. After the semifinal victory, the governor congratulated the coach and complemented their strategy. Though they finally fell in the final round's second match, Lingle was still excited by their performance and the promise the program holds for Hawaii's future. "We're transforming our economy from a focus on land development and tourism to the human capacity of young people," she said. In addition, Waialua High School won the FIRST Engineering Inspiration Award, which celebrates outstanding success in advancing respect and appreciation for engineering within a team's school and community.